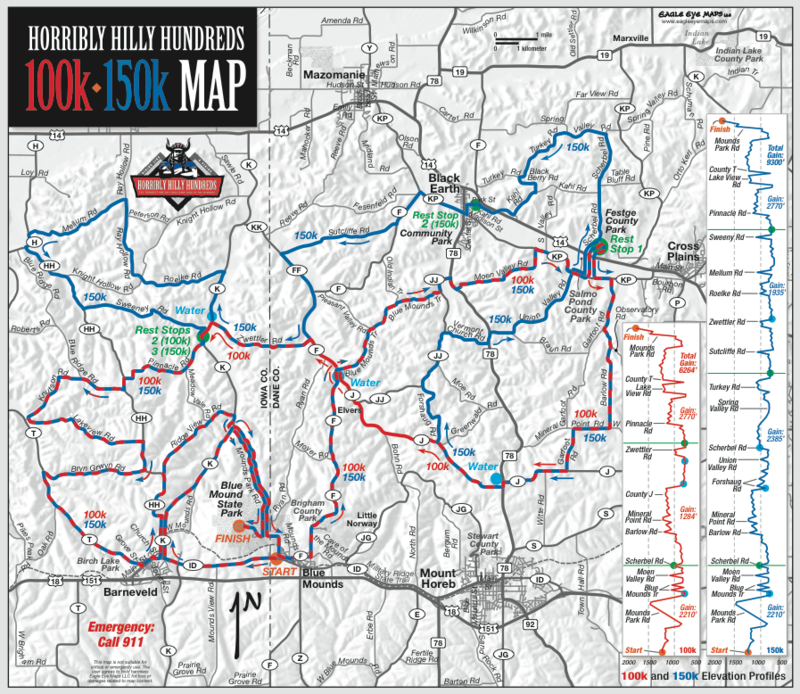 The Horribly Hilly 100k was…well…hilly. But it wasn’t horrible–except for the parts that were. It was fast, slow, cool, somewhat warm, sweaty, and painful in turns. It’s also the first event this year–after a DNF at the Almanzo and a couple of cancellations–that I’ve both started and finished. The course, which consists of roads that I’ve ridden multiple times in bits and pieces over the last 20 years but never strung together in this way, remains a fleeting impression. The statistics perhaps bear out why it feels like a strange course. Some of it goes by very slowly and some of it very quickly. Fast descents always go by too quickly. And the part that goes by very slowly–the steepest climbs–put you into a timeless zone of suffering and pedaling. Earlier in the week, I’d decided to ride the Soma ES even though it’s fendered and a little heavier (well, ok…several pounds heavier) than the Salsa La Raza. I’d been heading that direction partly because I’ve not put a lot of miles on the La Raza yet and didn’t have it quite dialed in and also because the gearing on the Soma is a little bit lower. Later in the week, I still planned to ride the Soma, but was vascillating–as I’m wont to do before an event. The rental car decided the issue for me. I ended up with a Ford Focus, which just isn’t big enough to fit the Soma with the front wheel off and the front fender still attached. In typical pre-event fashion, I didn’t figure this out until about 8pm on Friday evening. I didn’t feel like de-fendering the Soma, so it went back into the basement and out came the Salsa La Raza. I’d managed to alleviate most of the front-end oscillation problem I’d been having by lowering the bars slightly and by very carefully realigning them, but I still wasn’t sure how it was going to perform. But, there’s not time like the present to find these things out, and I guess I’d rather find out on a well-supported ride with lots of SAG than one of my usual solo weekend rides. On the flats, rollers, and downhills the La Raza performed like the race-bred steed that it is. It flew up and down the rollers, often still in the big ring. On steep descents, especially when down in the drops, it locks itself to the road and holds a line without a twitch. On several sections that were covered in pea gravel, it handled very well and left me confident to go faster than quite a few other riders. It’s on the climbs–when at the low end of the gearing, pedaling at a higher cadence, and with less weight on the front end–that the handling still turns squirrely, though not as much as before. It’s not a danger, but it does mean it’s harder to hold a line and that too much of my power output is going somewhere other than making the wheels go around. I’m going to talk to the guys at Cronometro about this–but I suspect that there’s little to be done because the frame itself is pretty flexible. For this ride or another like it, I’d also consider slightly lower gearing. Right now, the La Raza is running 50/34 with a 12-28 cassette. Something with a 30t (or even 32t) bailout gear might have helped matters somewhat–but it would probably be better if I just dropped another ten pounds and did some more early season climbing. After all, this course isn’t so steep that one shouldn’t be able to do it with a regular but rational gearing setup. Aside: The only part of the Salsa’s setup that was truly problematic is the Planet Bike handlebar tape and the Ultegra brifter hoods–both of which turn very slippery when covered with sweat. For someone like me that prefers not to wear gloves, this is something of a problem–especially when climbing out of the saddle on the hoods. The tape was only temporary (the LBS didn’t have my preferred Cinelli cork tape in stock), but the hoods are another problem altogether (and, I should point out, not something that is a problem with the SRAM brifters on the Soma…Shimano must use different rubber). While the bike performed better than expected, the rider left something to be desired. The plain fact is that I’ve not had enough hilly miles under my wheels this spring, and certainly nothing so hilly that I was reduced to grinding along in and out of the saddle in a 34×28 at 4mph. It’s also true that while I’ve lost a good deal of weight in the last year and a half (a little more than 50 pounds all told), I wasn’t able to slim down as much as I’d planned. On top of that, I spent most of the week previous off the bike entirely, on the road for work, and drinking the many different beers in Portland. It turns out that this is not the best way to taper for a difficult event like the HHH. In general, however, I knew that I could make it to the top of the steepest climbs. After all, I’ve climbed them all before at one time or another and most of them when I was significantly heavier and perhaps less fit. Sure, some of the climbs would push me into a deep, dark painful place where there’s nothing but the sound of my own breathing and the pain in my legs (and the rest of me, for climbing steep hills on a bicycle is a full body affair). But, it was the cramps that nearly did me in. Even though I was well hydrated (I went through nine large bottles and a whole tube of Nuun tablets during the ride), my legs still revolted at the slow cadence grinding on several of the climbs. At first it was my left calf; this would improve if I soft-pedaled a bit or got out of the saddle to change the angle of attack. Later, it was hamstrings and calves together. When that happens, there’s nothing to do be get off, stretch, and walk until the cramps go away. So that’s what I did for varying stretches on five or six of the climbs (I tried to keep track, but my mind was elsewhere), including the final climb into Blue Mounds SP itself (though I was able to pedal more than half of the final climb and ride across the finish line). So, if I’m going to do this event or one like it again, I’d best lose some more weight, ride some more hills, and get the cramps sorted out. The Viking Biking Club gets top marks for how they organize and execute this event (which is so popular that they’ve had to move to a lottery entry format). The course is very well marked (I never needed a map), there were tons of friendly and helpful volunteers at the start, finish, and on the course itself. It seemed like three quarters of the motor vehicles that we saw on course were related to the event (radio, officials, SAG). Water stations were plentiful. Feed stations were well-stocked with a variety of things, including the sorts of real food that I prefer to eat (in particular, already-peeled hardboiled eggs and fresh blueberries)–though it was particularly bloody-minded to put the first feed station at the top of a steep hill that you just rode back down after feeding. The event t-shirt is a high quality item from SweatVac and nicely printed. I have only one quibble: event photos seems to be of the sort that are next-to-impossible to view online and require purchase to print or use in any way on the web. Looking at the photos from the last two years, I’m not impressed. Wouldn’t it be better to engage a few more volunteers and just post them on Picasa or Flickr instead of engaging a professional photographer who was stationed at only two places on the course (Garfoot/Hwy J and the finish) and will make us pay not only for prints but for using the photo online? I’d gladly ride another one of their events. They are on the expensive side of what I like to spend for a day of bike-related suffering, but at least you generally (the photos excepted) get what you pay for.